Staff Sgt. 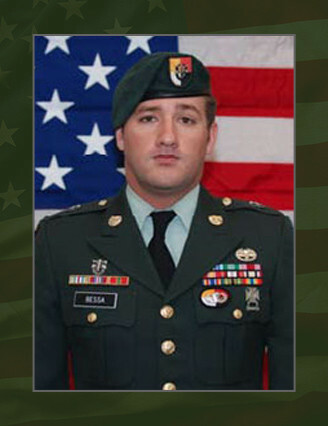 Jeremy E. Bessa, 26, was killed by an improvised explosive device while conducting a mounted combat reconnaissance patrol. He was a Special Forces Operational Detachment-Alpha team communications sergeant assigned to Company B, 1st Battalion, 3rd Special Forces Group (Airborne). He deployed in support of Operation Enduring Freedom in January 2009 as a member of the Combined Joint Special Operations Task Force – Afghanistan. This was his second deployment in support of the Global War on Terror and first deployment to Afghanistan. Bessa, a native of Honolulu, Hawaii, volunteered for military service and entered the Army in April 2002 as a combat medic trainee. After basic and advanced individual training and Airborne School he was assigned to the 1st Battalion, 319th Airborne Field Artillery Regiment, 82nd Airborne Division at Fort Bragg, N.C., in January 2003. He deployed in support of Operation Iraqi Freedom September 2003. Bessa attended the Special Forces Assessment and Selection prior to being assigned to John F. Kennedy Special Warfare Center and School at Fort Bragg, N.C., in May 2005 for Special Forces training. He earned the coveted “Green Beret” in March 2007 and was assigned to 1st Bn., 3rd SFG(A) at Fort Bragg, N.C., as a Special Forces communications sergeant. Bessa’s military education includes the Survival, Evasion, Resistance and Escape Course, Basic Airborne Course, Basic Noncommissioned Officer Course, Warrior Leaders Course, and Special Forces Qualification Course. His awards and decorations include the Joint Commendation Medal, Army Commendation Medal, Army Achievement Medal, Good Conduct Medal, National Defense Service Medal, Afghanistan Campaign Medal, Iraq Campaign Medal, Global War on Terrorism Service Medal, Noncommissioned Officer Professional Development Ribbon, Army Service Ribbon, Parachutist Badge, Combat Medics Badge and the Special Forces Tab. Bessa is survived by his wife Lindsey and their son Carson of Fayetteville, N.C.; parents Ted and Julie Bessa of Whispering Pines, N.C and brother Christopher L. Bess, Fort Carson, Colo.